I first saw this recipe on Real Mom Kitchen. 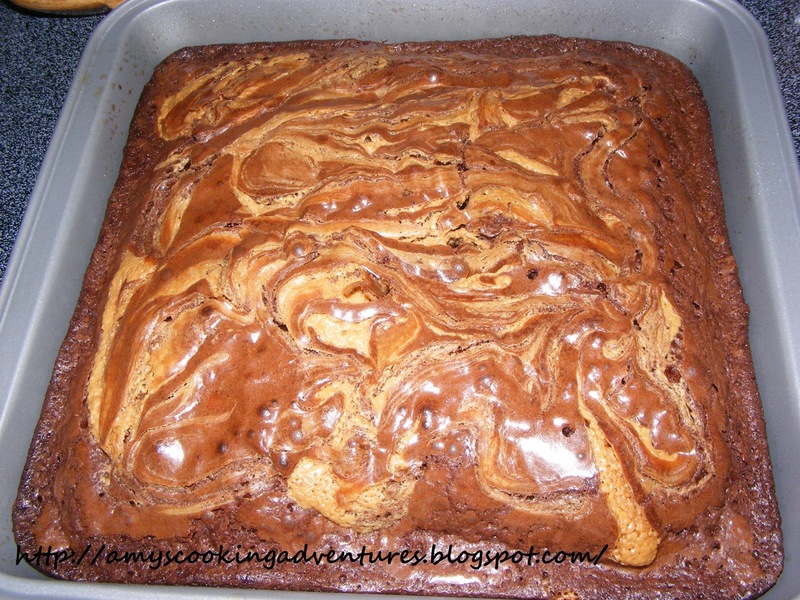 The brownie and peanut butter combination sounded heavenly (Reese's peanut butter cups, anyone?). These are super yummy, but I am thinking of some adjustments to make next time, so watch for part two of this recipe in a few weeks! This makes a really tall thick brownie that got really dry on the edges by the time the center was cooked. I think next time I will either try making brownies the regular way (not the cake-like brownies) or I may try using a larger pan. My peanut butter mixture also got rather crumbly, so I will be experimenting to find a way to make it stay together a bit better! 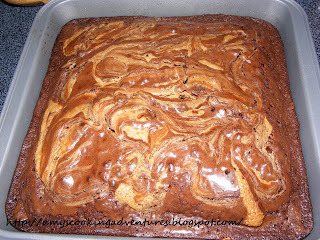 But, if you like nice, thick, cake-like brownies, this is the recipe for you! Preheat oven according to brownie mix. Grease and 8 inch square pan, set aside. Prepare the brownie mix according to instructions for cake like brownies, this typically means adding 3 eggs instead of 2. In a separate bowl, stir butter, confectioner's sugar, peanut butter, salt, and vanilla together until smooth. Pour half of the brownie batter into the pan. Top with dollops of about 3/4 of the peanut butter mixture. Pour remaining brownie batter on top, coving peanut butter. Drizzle the remaining peanut butter on top and use a knife to swirl through the layers. Cook according to box instructions for an 8x8 pan. Brownies are fully cooked when a toothpick inserted into the center comes out mostly clean. Cool and enjoy! *I used 3 tbsp unsalted butter, and 1 tbsp margarine--I ran out of butter!